Administering pills or capsules to your pet can be challenging. For some pet owners, medicating their cat or dog is a struggle that borders on being impossible. If your pet is one of those hard to pill pets, Greenies Pill Pockets may be the answer you need. As a veterinarian, I understand how having to struggle to medicate your pet can lead to your pet not receiving the medication that he needs. However, this is not a good solution and is not in your pet’s best interest. 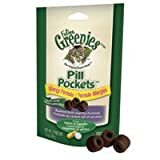 Greenies Pill Pockets are a hollowed-out treat in which a pill or capsule can be hidden from your pet, making administering necessary medications much simpler. 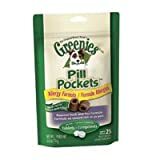 The taste of the Greenie’s Pill Pockets effectively hides the taste of the medication, making giving the medication a pleasant experience for both you and your pet. Using Greenies Pill Pockets is easy. Simply insert the pill or capsule inside the hollow area in the center of the pill pocket and press the open end closed. The pill pockets are soft and easily manipulated. Offer the filled pill pocket to your pet as a treat. For pets that are especially clever, there is a trick that I learned from colleague, Dr. Mary Becker. Rather than giving only one treat, use three treats instead. This trick will work with Greenie’s Pill Pockets very well. Fill only one of the pill pockets with the medication. First give your pet an empty pill pocket, then give the pill pocket with the medication inside, then another empty pill pocket. Most dogs and even some cats can be tricked easily in this fashion even if they are suspicious initially that the treat is medicated. 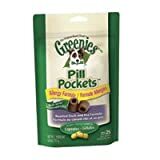 Greenies Pill Pockets offer a variety of flavors so it should be easy for you to choose a flavor which your pet enjoys. There are even options for those pets with allergies. 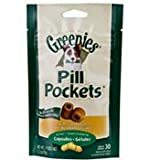 If your dog or cat needs medication which you are unable to administer or have to struggle with, give Greenie’s Pill Pockets a try. For many pets, these pill pockets turn medication time into treat time, helping you to care for your pet without ruining the bond between you. Many of my veterinary clients use them with great success. Makes giving medicine a treat. 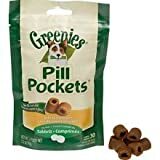 Greenies Pill Pockets treats for dogs are a nutritious treat that contain a built-in pocket, perfect for hiding a pill or supplement. Dogs love the taste so much they wont even notice theres medicine inside! 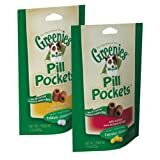 Find more Greenies Pill Pockets products on Amazon!